I am so excited that I actually got figs from my tree! I never grew a fig tree before and early in 2016 I saw a little baby tree at a store, purchased it and brought it home. To my amazement it produced fruit the very first year. But, sadly, they didn’t ripen. This season, not only did I harvest enough figs to make this small batch fig preserves, but I have enough for eating and baking and still there are more ripening on the tree. 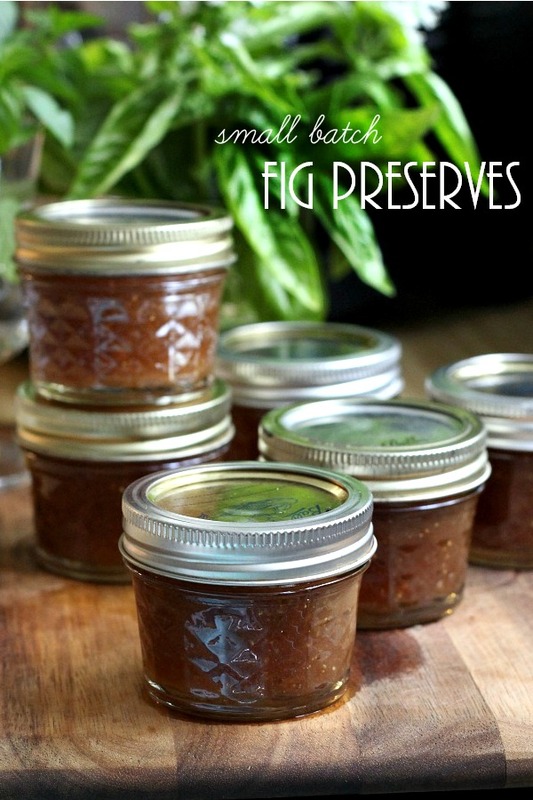 I’ll be sharing two more great fig recipes really soon! This Brown Turkey fig tree has grown considerably in just two years. 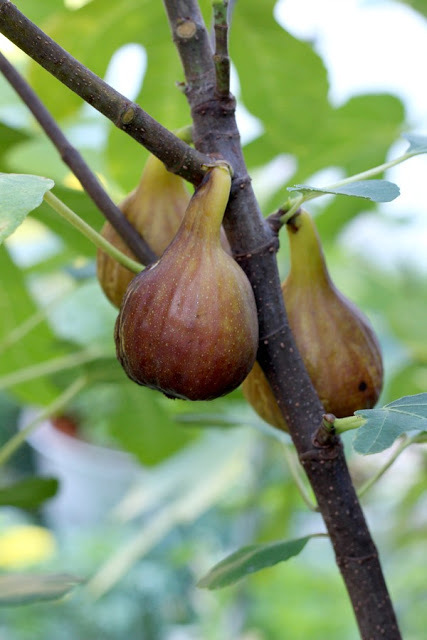 Besides being delicious, figs are a great source of fiber and full of vitamins and minerals. Figs are a healthy and versatile ingredient that adds a burst of sweetness to all kinds of dishes. I had to tie up some of the branches but just look at all of the figs! 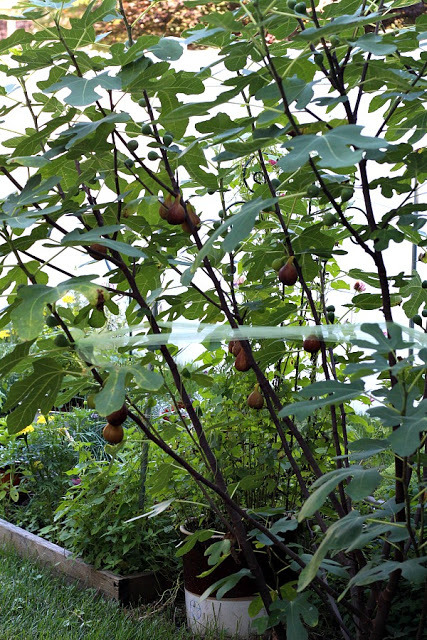 There are also many, smaller, green figs that I hope will ripen as well. 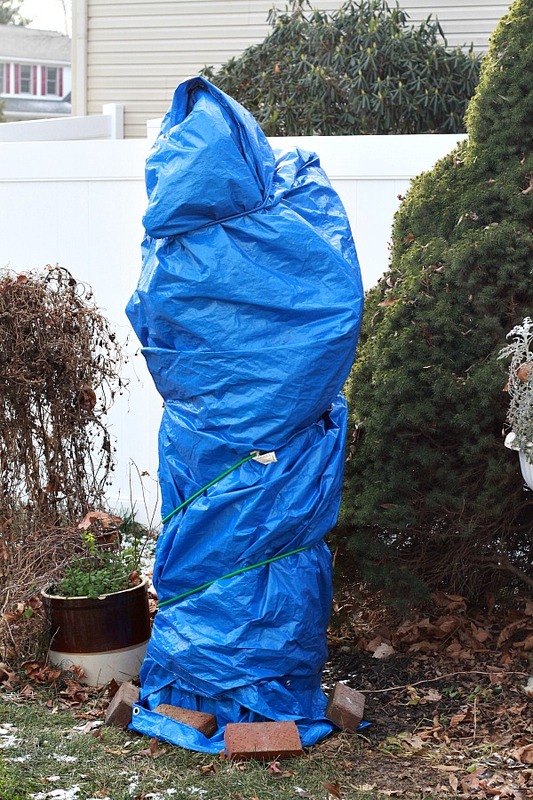 A cold snap was coming so my daughter and I quickly ran out and grabbed a tall shepherd’s hook, an old rug, a tarp, some bungee cords and bricks. and went to town wrapping the tree. When we stepped back THIS is what we saw. I was teased all winter about the mysterious figure standing outside our dining room window. Well, it might have been a scary, unattractive sight but it worked. The tree survived our cold winter and rewarded us with a nice harvest of fruit. 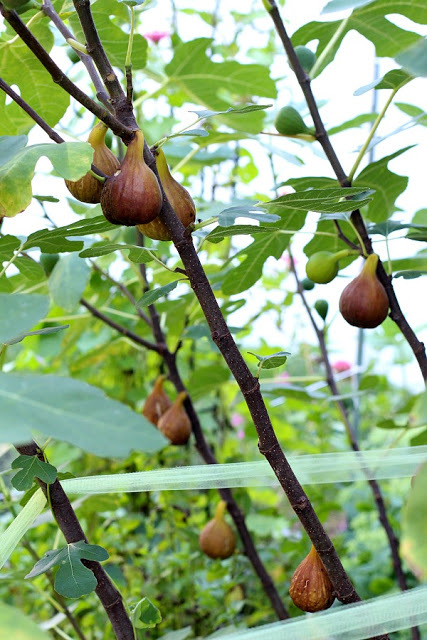 If you don’t have a fig tree in your backyard, figs are coming to markets now. 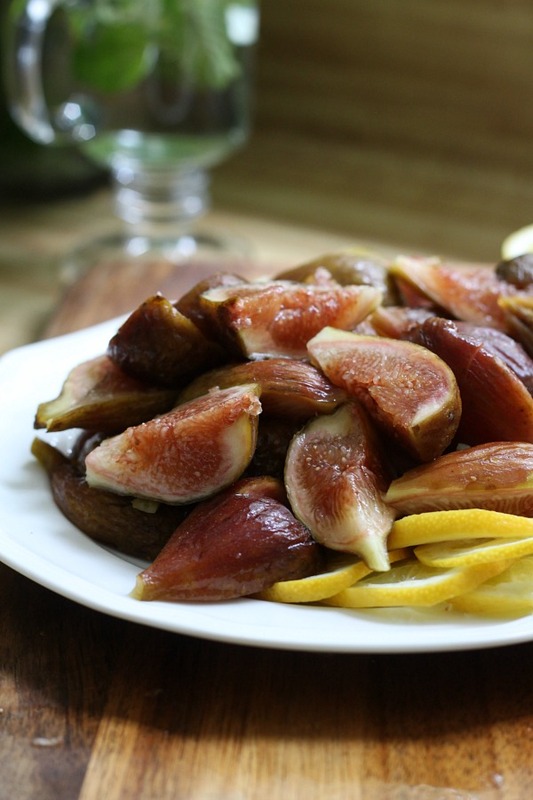 This recipe used just 1 pound of figs. That was about 16 figs from my tree. 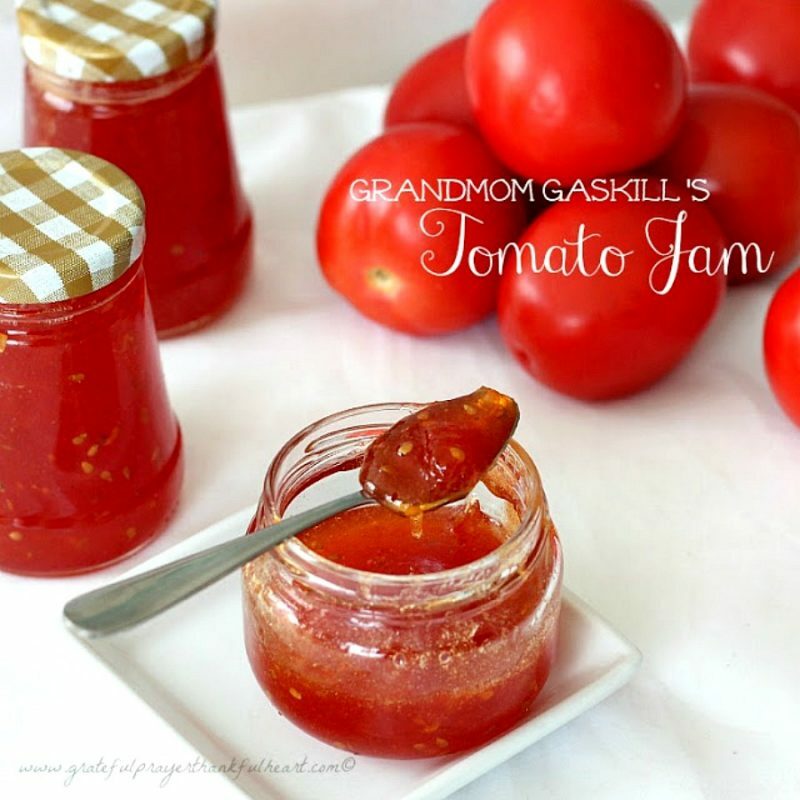 The preserves are easy to make and the six small jars will be so nice to have through the winter months as we await another harvest next year. 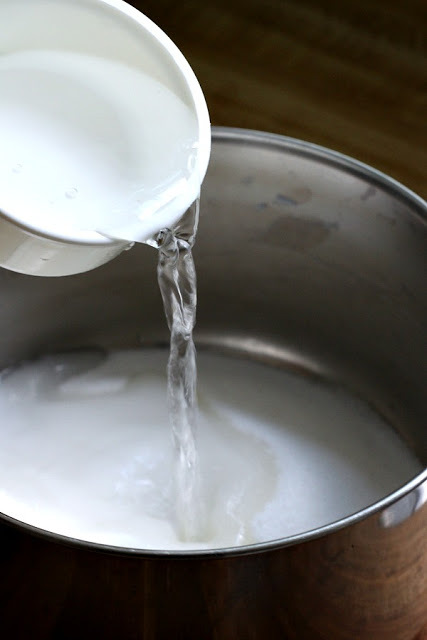 Start by combining the sugar and water in a saucepan. 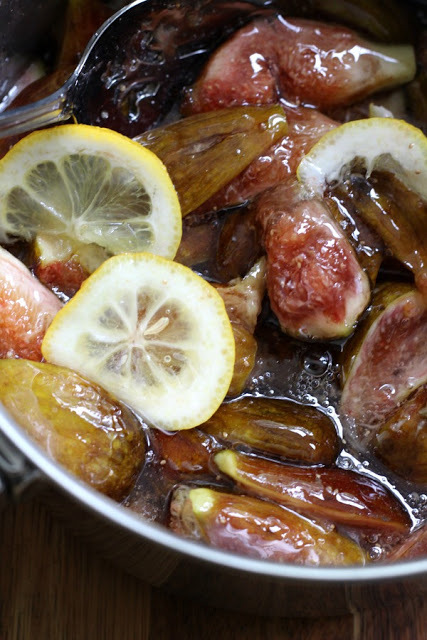 Allow the syrup to cook while preparing the figs and lemon. 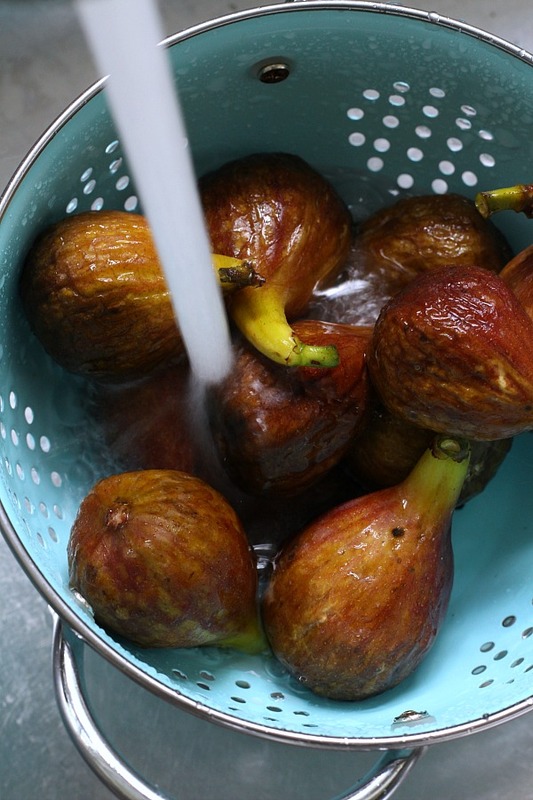 Wash the figs under cold, running water and blot dry. Slice the figs in half and in half again. 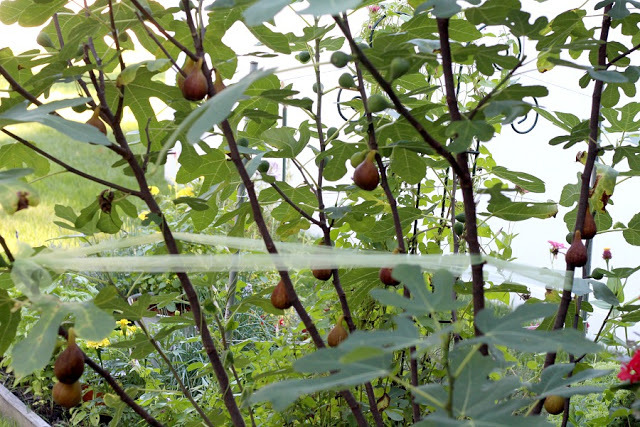 No need to peel but cut off the stems if they are too long. When the syrup is finished cooking, add the figs and lemon and stir to coat. Return to a boil, reduce heat and simmer 30 minutes longer. When the mixture is thickened, remove from heat and very carefully pour the very hot mixture into the blender. I leave the cover just slightly ajar and place a kitchen towel over the top just to protect myself and the work area should there be splatters. Pulse until the figs and lemon are pureed into a nice constancy. Pour the preserves into jars and process in a hot water bath for 10 minutes. Beautiful fig preserves to spread on cheese and crackers, for appetizers, on yogurt with granola or on a muffin or scone. Enjoy! In a medium saucepan, add the sugar and water; place over high heat and bring to a boil, stirring frequently. 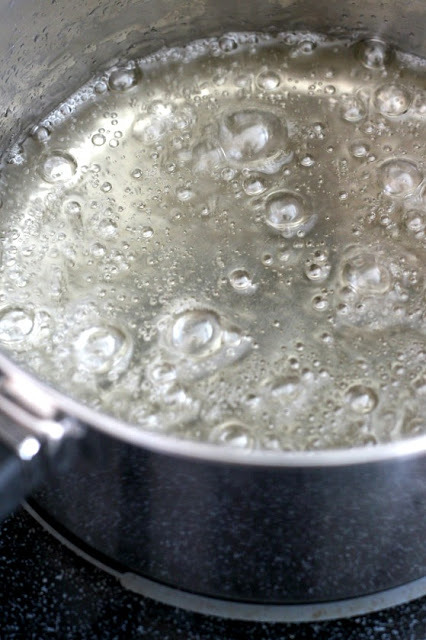 Reduce heat and boil gently for 15 minutes or until the syrup begins to thicken. 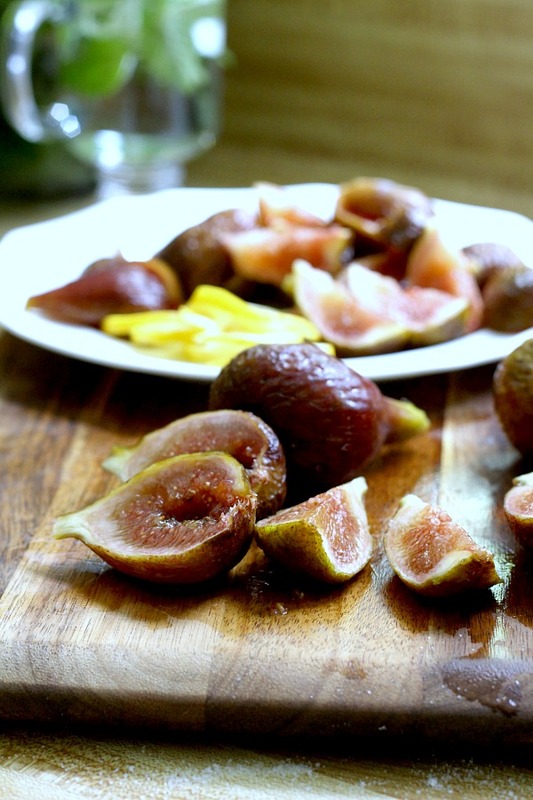 Add the quartered figs and the lemon slices. Return to a boil and boil over high heat 1 minute. Lower heat and simmer, uncovered for 30 minutes. Remove the pan from the heat and very carefully pour the mixture into a blender. Pulse to grind the figs and lemon. You may want to return the mixture to the pan and cook 10-15 minutes longer to desired thickness. I did not have to cook any longer. 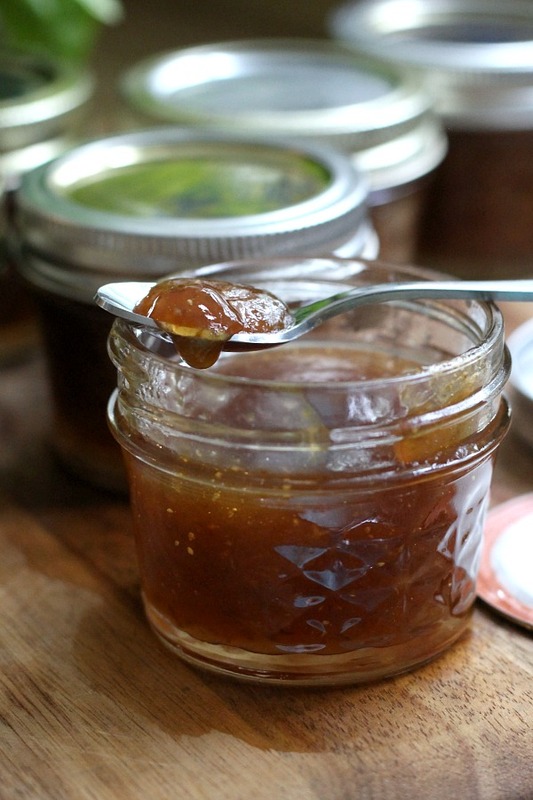 Remember, the preserves will thicken as they cool. 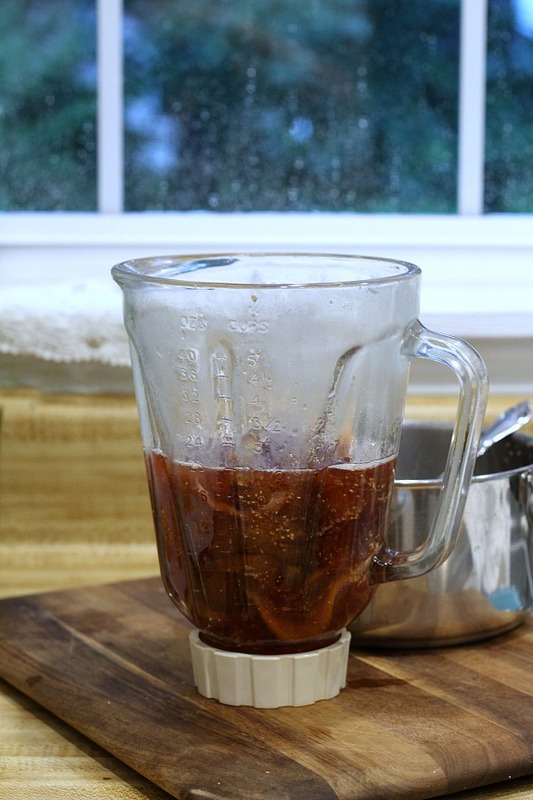 Ladle into clean, hot, sterile jars and process in a boiling water bath for 10 minutes. 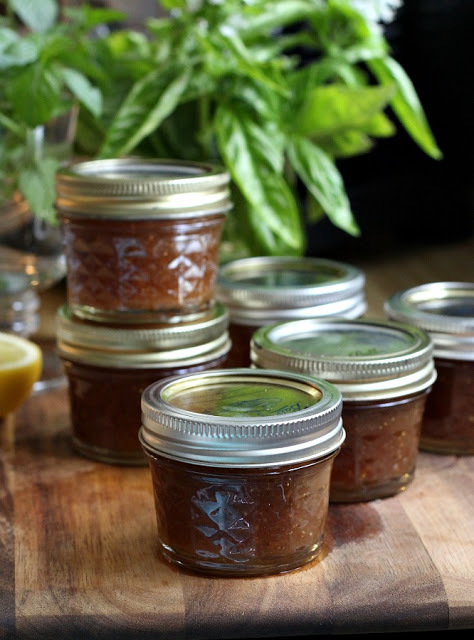 I got 6 little 4-ounce jars from this recipe. Yummy, yummy, yummy! I love figs. When I was little girl in Mississippi, our neighbors across the street had a fig tree in their back yard. A few of us may have gotten in trouble for sneaking over there and snatching some. 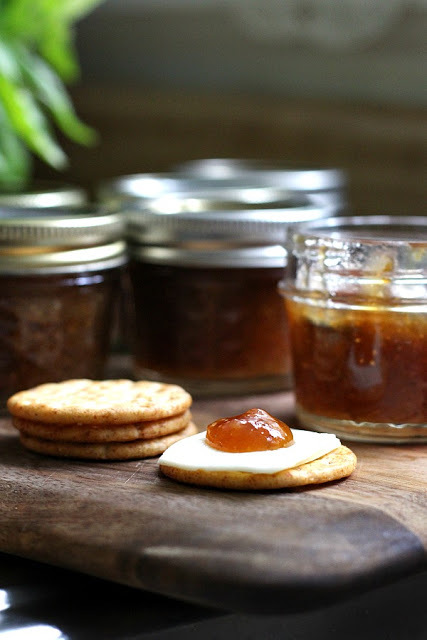 🙂 My Mammaw made the best fig preserves … and my Aunt Dot made the best biscuits. A match made in heaven. Yum! When I moved here 21+ years ago, I brought a start from the fig tree at my old place. The figs from the original tree were SO delicious and plentiful (the ants loved them too though). But, while the start took and grew, it never produced fruit and eventually died. The memory of eating them fresh from the tree, still warm from the sun, has stayed with me all these years.